Does anybody have the master .DB files? I'm looking for the original database files as they exist on the game disc. I have dozens of sets of rosters on my PC but I can't find the originals anywhere. Thanks for the quick response Kiba! I briefly looked at the rosters with NHLInfo and saw some weird stuff which makes we wonder if they are the true originals. The games to be played for Boston looks really high. Sergei Fedorov centers both of the power play lines? Are these just mistakes that EA made with their original rosters? Those db's are from cd. If they are corrupt somehow, I dunno, who knows for sure? I checked and it looked the same on NHLinfo for me too, Boston had strange amount of games and Fedorov were on both PP lines. I made a season in game and then NHLinfo showed right amount of games for Boston on that season. Maybe NHLinfo shows those games wrong for Boston, for some reason? Anyhow it seems to be corrected when making a season. You can get your hands to NHL95 CD and check this out, I suppose it is NHLinfo which makes amount of games look wrong for Boston. Thanks. The AI shoots and scores maybe once in awhile, but that once in awhile is still too much. I am the guy at thebreakaway.net forum that managed to make nhl09 super realistic. There was a AI tool that I mastered and shared the settings to everyone. But, that was years ago and I tried a few more tweaks trying to be perfect and it just crapped my game. It was fun while it lasted though. I really loved NHL94. It was the funnest hockey game I ever played. 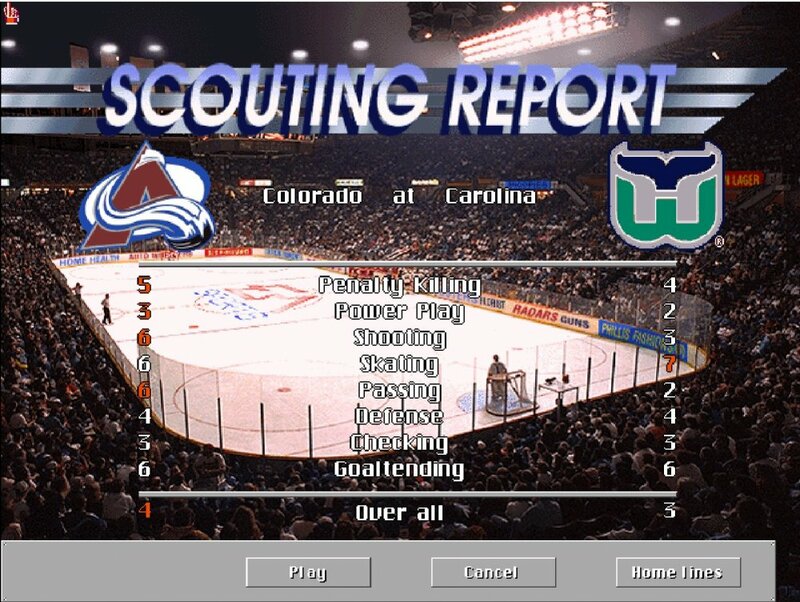 NHL 95 PC is basically NHL94 with better stats and a potential for hacking. I hope somebody will pick this game up again and produce mods for it. Imagine realistic gameplay with 2014 abilities and a fully moddable game for NHL94! NHL 95 PC has that potential. NHL 95 is basically NHL 94 but it is updated and polished in many more ways, not just in stats area. 95 looks better, is smoother and from gameplay point of view there are huge and important differences. For instance goalies' behaviour. This game is FANTASTIC! I want to thank the person who posted it. IT IS MY FAVORITE GAME!!!!! Here is tutorial for changing Scouting Report logos in NHL95PC. In NHLinfo I changed attributes , the game is now faster and even more goals ....... can disable over time in the season ? That way game goes to 4th period but there is no time to play, so on regular season that should work. Which logos do you mean? - On Scouting report screen I have posted instructions there. - Logos on center ice are editable but I don't know how they have done it on some mods. One possibility is to disable center ice logo and paint it to ice itself, like on goodbyeccha's NHL15 conversion. I am changing Tamba Bay logo for Colorado Rockies logo in Scouting Report screen. I will use Dosbox, NHLinfo and GIMP. First I open Dosbox, go to NHL95 and there to scouting report. Then I press CTRL-F5, which makes screenshot of scouting report to my dosbox capture-folder. I open that file in GIMP (free software for graphics editing) and leave it open. Logo must be 94x91 as size, you can verify that in NHLinfo by looking TB logo there. 2 first palettes are from images which I have open in GIMP. #19 is from my scouting report screenshot. If you are uncertain which it is, you can see that number in GIMP by looking picture's title. I also changed Tamba Bay text to Colorado by NHLinfo, if someone wonders that in picture. I bet there is better ways to do this, but this worked for me. I hope this helps NHL95PC editing in future. Hi Kiba, it looks great but I am too dumb to manage it:-( Do you have some done files you could send us? I'm in nhlinfo and this is not coming up for me... I have the nhlinfo program in with all the other files and I'm not sure where I can go to from here. There's not a list of logos that are in black and white like your tutorial says. I have my logo ready to put over the old one and I can't seem to access any list within that SRLOGO.QFS file... Help please. I hope this helped you, happy hacking! That is helpful but my issue is that I'm not getting this file listing in the first place to find the SRLOGO.QFS file. I'm wondering what I'm doing wrong. Hi, just select "View all kinds of image files and replaces EA SHPI-images" when you have started NHLinfo. Then you should have that list. hmm that is strange. Mine doesn't show that. I will take a screen shot when I get home today after work and post it so you can see what I'm dealing with. I am using a copy of NHL95 that is set up to quick load through dosbox.. wonder if that's the issue, but I've been able to edit the team names, lines and jerseys still as it has all the files available within the folders. You're awesome Kiba! thank you! This version of NHLINFO is sooo much better. A lot easier than to run it through dosbox. Got it working Kiba! thanks again. Looks like I have found success! Now is there a different spot for the starting line up logo? Thanks Kiba. goodbyeccha sent me all the directories that I need to change up. Didn't realize there were so many logos. Can someone post the original EASNDESK.QFS file? I was trying to edit it and I screwed up and didn't save the original file. Many thanks in advance!